IMLAY CANYONEERING ROPE is made for the rigors of canyoneering. Tightly woven of 100% polyester for toughness and water-non-absorbance, our static rope has a tight, thick sheath that resists cutting and abrasion. 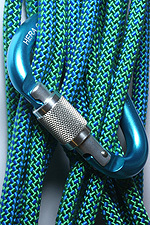 The polyester core and sheath work together to make a nice handling, very static rappelling rope. Yes, you can use any-old rope for canyoneering and achieve performance somewhere between bad and OK (with occasional forays into disasterous). Or you can use Imlay Canyon Ropes, designed JUST for canyoneering, and achieve excellent performance at a reasonable price. ROPE Imlay Canyon Rope is true static rope. In canyons, static rope is good. Not only is "rappel bounce" unpleasant for descenders, but bouncing the rappelling rope where it crosses an edge above you tends to gradually chew up your rappel rope. Our canyoneering rope is made 100% of polyester, a strong, tough and naturally non-stretch material. At bodyweight (200 lbs), all our static ropes have a stretch of 1/2 to 1%. ABSORPTION Canyoneering tends to take place in, on, under and around lots of water. Canyoneering rope that resists water absorption is easier to use and carry, and it lasts longer in this difficult environment. 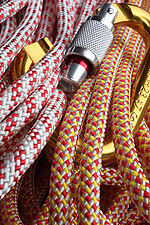 Imlay Canyon static rope is 100% polyester, a naturally hydrophobic fiber. Nylon loosely bonds water molecules to its structure, becoming heavier, weaker and less tough. Polyester avoids these problems by ignoring the water molecules, and maintaining its original properties. Polyester rappel ropes still holds some water on the surface, but substantially less than nylon rappel ropes, and the surface water dries pretty quickly. DIAMETERS We make pretty much the same canyoneering rope in three diameters (plus a 6mm Pull Cord) to suit the taste of canyoneers from Leprechaunish speed specialists to Bubba-esque casual rappellers. Select the rappelling rope that meets your needs and matches your equipment, training, and skills. DURABILITY Cavers have long known tightly woven static rope lasts longer when subjected to abrasion and rubbing. We carefully craft our rappeling rope for a firm hand, but with enough softness to knot and handle well. Imlay canyoneering rope may feel a little stiff when brand new, but it breaks in quickly to develop a workable, medium hand. Lightweight static rope canyon adventures far from the road, when low bulk and weight are high priorities. Best for lower-weight, high-skill-level canyoneers in Class A and B canyons. Not recommended for Class C (flowing water) canyons, nor for canyoneers over 14 stone. The first canyoneering rope specifically designed for Colorado Plateau, the Canyon Fire breaks static rope conventions by packing more material in the sheath (56%) for greater durability and toughness, while keeping the core smallish (44%) for a lightweight and compact carry. Think of it as an 8mm core with a 9mm sheath. The extra-thick sheath gives it a softer feel which many people like. It rappels just a tad slower than an 8mm rappelling rope, so select your device and rig it as for an 8mm rope. The Canyon Fire has proven an exceptionally durable rappel rope for its weight and price, by using clever design rather than fancy (and expensive) fibers. More weight equals greater durability. The Imlay Canyonero 9.2mm excels when durability, value and robustness are priorities in your rappelling rope. Great for Class C (flowing water) canyons where the water flow beats your static rope against the rock. Provides a lot of rope to hold onto, both for less-skilled canyoneers and for the more-gravity-tugged-upon among us. When comparing to other static rope, look at the weight per 100 feet, or the grams per meter. 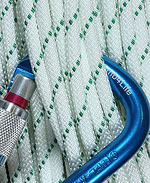 Many static ropes claim a larger diameter, but contain considerably less material, resulting from a very soft weave that holds up to abuse poorly. The Canyonero rope is tightly woven to resist cutting, plus uses a somewhat sheath-heavy design (52%/48%) to increase toughness and increase value. 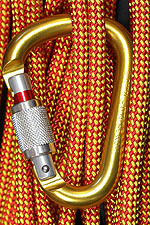 We bring the desirable properties of polyester static ropes to small-diameter pull-down cord, useful at times for greater efficiency when using single-rope-technique. While not as stiff as a proper rappelling rope would be, the essentially-static properties make difficult retrievals easier. 100% Polyester means less water absorption. Large enough that a Tibloc w/ (new) Attache carabiner will grab it. Almost strong enough to rappel on doubled (but not really). Please note: a pull cord is far less useful in a rescue situation than an actual 8+ mm static rope. Carrying a pull cord is for expert canyoneers in controlled conditions.